Artist Arayik Petrosyan, who got concussion and was treated for three months in hospital as a result of a severe beatings on March 1, 2008, is convinced that police operations on March 1 were organized “at the highest level”. Robert Kocharyan’s advocates announced yesterday that Kocharyan had not ordered the law enforcement officers to break into the Liberty Square. Whereas, on the preceding days, Kocharyan had publicly spoken about the necessity of releasing the square. Ara Petrosyan, who spent March 1 and early days in the Liberty Square, remembers how the police attacked. 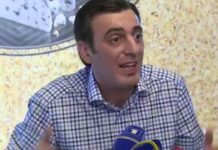 “We heard Ter-Petrosyan’s [opposition leader’s] voice, who was asking the people to keep distance, not to approach the police until we found out what they wanted. And they wanted to disperse us, although they did not give any warnings or calls, just started going forward with truncheons,” said Ara, adding that their resistance was short; they ran towards the North Avenue. “In short, they were beating and smashing anyone who they saw. But not everybody ran away because there was a feeling amongst us that a big injustice was being committed. I was in the group that did not escape feeling as if, by staying, we were somehow resisting. That was the group that eventually reached the French Embassy,” said Ara. Near the Marriott hotel, Ara felt that he could not run any more, got into a corner and laid down on the ground, covered his head with his hands. “When the police saw me, they approached and started booting me and beating with truncheons. I felt how someone hit my head with a heel and after that I do not remember anything; I passed out”. With concussion caused by the beating of the police Ara remained at the Republican Hospital for about 3 months, but never was recognized as a victim. A few days after the incident, the investigator came to the hospital and threatened to incite a case against him for resisting the police unless he stated that he had fallen and injured his head. Ara, who was in serious condition at the hospital, agreed. Only a few months after the incident, they called Ara for a forensic examination when the blackened body was mostly healed. 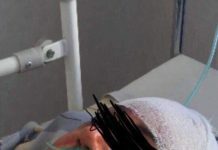 43-year-old Khachik Davtyan, a resident of the Little Vedi village, who was handicapped after March 1, is also awaiting justice and punishment of the investigators who have treated him unjustly. On March 1, 2008, Khachik Davtyan’s foot was almost torn off due to the use of Cheryomukha 7 [gas grenades with shot weapons]. “My foot was almost cut off from my shin. My brother and friend took me from there to the hospital and I was in the hospital for a month and 20 days,” Khachik Davtyan told Forrights.am. Khachik took part in the rally on March 1, 2008 and the previous days at Liberty Square and witnessed how the law-enforcers “cleaned” the square. “I was sitting in front of the tent when the Red Berets and special detachments entered the square and started the beating. They hit everyone. They hit my head with a truncheon, my teeth fell to pieces,” Khachik said, continuing, “I remember, there was a pregnant woman in the sit-in strikers with her children whose house had been taken and she became a protestant, she was dragged and beaten so much; she was all covered in blood”. Police officers tried to arrest Khachik Davtyan from the Liberty Square area, but he escaped from the window of the police car and hid for some time. Then he went to a dentist whom he knew and who showed first assistance with his broken teeth. In the evening, Khachik returned to the demonstrators to take part in a huge rally near the Myasnikyan statue. “Immediately after it became dark, shootings began. I witnessed how the police car ran over people targeting the demonstrators. Then we made barricades with garbage boxes. I’ve been near the bridge. On the bridge, right in front of my eyes, a boy got a bullet on his head and, I believe, he died because his head exploded. They put him in a car and took away. After half an hour I got wounded by “Cheryomukha 7,” said Khachik. He also witnessed how the supermarket “Yerevan City” was robbed that day. “Before I was wounded, I saw how people in civilian clothes came out of the police forces, 4-5 men, approached the “Yerevan City “and smashed the glass windows with hammers. Whatever there was to take, they took and said to the people, “Take what you want,” told Khachik Davtyan who has witnessed lootings organized by the state authorities as provocation. 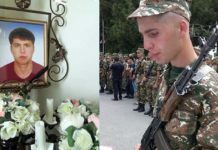 Heavily injured Khachik Davtyan was subjected to worse tortures after leaving the hospital, in the office of the prosecutor. Without any prior notice, he was taken to the police station with walking sticks. When Khachik Davtyan categorically refused to write the testimony they demanded from him, they started threatening him. “Gor Hovakimyan took me to the stairs and said, ‘Is this your broken leg? If you do not answer my questions the way I want you to, I’ll break your other foot too: I will shoot it and will tell that you were escaping that’s why I did it’,” told us the victim. Armen Khachatryan, a member of the Armenian National Congress (ANC, a political party) Legal Commission, who has been involved in the case of political prisoners and wounded on March 1, considers it important to initiate a new criminal case, as, in connection with March 1 and the following days, over 50 citizens were prosecuted, imprisoned and convicted under Article 316 of the Criminal Code — “in violation of the lawful demand of the police”. “But now, when it is clear that the police actions were illegal, new circumstances are emerging,” said Khachatryan, adding that, therefore, the convicted persons, who were sentenced for disobeying the legal requirements of the police after March 1, 2008, may apply to the Prosecutor General’s Office with newly emerged circumstances so that the Prosecutor’s Office appeals to the Court of Cassation to overturn the verdicts and vindicate those persons. “Justice with criminal proceedings leads to consequences, including compensation for illegal imprisonment,” concluded Khachatryan.